Do you have your holiday marketing in place yet? If not, grab this 10 day marketing campaign from “Small Business Stacey” so you can have your best holiday sales ever. Welcome, everybody. Small Business Stacey here. Do you know what it is? It is November, and that means holiday season is here. Me, personally, I’m one of those last minute people who is running to the store to grab last-minute gifts two days before. You guys, can you relate? The challenge is that, as a small business owner, you cannot do that. You need to get your holiday marketing into place, and my guess is that, if you’re here, live with me today, you need a marketing campaign, one that is going to help you be your best ever, so I’m literally going to lay out for you a 10-day marketing plan that you can put into action. All right. This is the first time I’m streaming with slides, so let me see if I can share my screen. Bear with me one second. All right. It’s working. Woohoo. All right. Here we go. Free Training Friday from Small Business Stacey, a 10-day marketing campaign, so you can have your best holiday sales ever. Let’s get started. All right. I have some good news to start out. There is a lot to be excited about this year because, from the latest reports that I’ve seen, sales are expected to increase by 15%. Wouldn’t you like to see a 15% increase in your sales? Well, that’s what they’re projecting. Last year, Thanksgiving sales were 1.93 billion dollars. Black Friday was 3.34 billion dollars. Cyber Monday, 3.45 billion dollars. There is a lot of money to be had there. Other good news is that people are spending more. Last year, people spent over $1,000 on holiday gifts, and this year, that’s expected to increase. Something you should be really excited about is if you market to households with over $100,000 in income, that number is expected to double. I’m always honing in on helping my clients market to the affluent, because who wants to deal with the bottom feeders, right? People who are just going to complain, looking for deals, return. You don’t want the bottom feeders, so go after the affluent, and you can have a really great holiday season. Other great news, people are starting their shopping earlier. Did you know 27% of people start their holiday shopping before Halloween. They’re in the active mode, guys. You need to make sure you’ve got your holiday marketing in place. For many small business owners, these last two months of the year are where they make a big percentage of their revenue, 40%. You need a marketing plan. There’s lots of things that you can do. Email is definitely one of the top marketing strategies that you’re going to want to look at. It’s free, and people will be checking their emails because, this time of year, they know that they’re going to be bombarded with companies contacting them with all these different deals, so people actually will be in their inbox for the next two months. You’ve got to be ready on mobile. Mobile is a huge component on holiday shopping. Some stats that I was looking at, 68% of shoppers visit YouTube on their mobile devices when making decisions of what to buy. It’s going to be a huge impact. 40% of sales last year happened on mobile devices. Make sure that your site is set up for mobile purchasing. Social matters, as well. People are going to be going online and checking you out because it’s not so much what you say about yourself. It’s what others say about you. You need to make sure that your social profiles are looking good, your reputation, your reviews, because people are going to be going out to friends and family, saying, “Hmm, is this a good deal,” or, “Should I buy this,” or they’re going to be asking for feedback on all different things holiday-related. The other part of social is your customer service. 55% of people want to handle customer service issues via social. You need to make sure that you’re able to respond immediately, that you have messenger set up on Facebook, and that you have Twitter ready so if somebody tags you. You need to make sure that you are ready. You need to test everything now. Go online. Check yourself out, and see how you appear for holiday shoppers. I want to share with you a website that I really like for doing this. It’s called responsivedesignchecker.com. You go there, you put in your URL, and it will show you what your site looks like on every possible device, from this little Nexus phone to a huge computer monitor. It’s really important that you do that now. All right? Because you need to be ready for all of these holiday shoppers. With all of that good news, unfortunately, Small Business Stacey needs to put a little small business squeeze on you because there’s a lot to be worried about this holiday for you small business owners. The reality is, look, you are going to be competing against the big guys, and they are already in the game. They have been for about a month now. Major retailers, they’re doubling down. They’ve already thrown a ton of money into online marketing, and that’s because they want people to start clicking early so that they are tagging them and eventually will be retargeting them later. We all know the big elephant in the room, Amazon. You never want to compete with Amazon. Amazon, of course, is already running 30+ days of Black Friday deals. You don’t want to compete with them. It’s just not a good marketing strategy. The reality is is that over the holidays, the cost of advertising is going to go up dramatically. It is going to be really expensive to pay to play, and my feeling is that it’s not the way that you want to go for your holiday marketing. I’m glad that you’re here with me today because what I’m sharing is not paid advertising. What I would like to share with you today is an email marketing campaign that you can use to reach out to customers, clients, patients, members, whoever you serve. If you have an email list, this is gold because they already know, like, and trust you. What I’m going to share with you is a holiday marketing campaign from beginning to end. What you want to do is start 10 days before, and you’re going to send out an email that asks what they want. What are they thinking about buying for the holidays? What would they love to see as a deal, because it’s not about you. It’s about them, and you want to show that you’re there to help them through the holidays. What I don’t encourage you to do is to think of things like a TV, a computer, something that is so commoditized. What you want to do is … here’s where you’re going to start thinking about, how can I get really creative with what I’m going to offer for the holidays, and I am a big proponent of holiday packages, something so juicy and unique that they just can’t get anywhere else, so they are going to buy it from you. For example, if you’re selling a mattress, that is so commoditized, and there will be tons of holiday, Black Friday, Cyber Monday sales for mattresses. You don’t want to compete on that, but what if you were to take that mattress and make it the “ultimate bedding package” where not only do you get the mattress, but you get the bedspring, the frame, the bedding, the sheets, the comforter, the pillows. You also get slippers, a robe, and maybe a stack of books to put next to your bed. You can come up with these fun packages. Think about, as you’re asking these questions, who are they buying gifts for? If you find that they’re looking to buy gifts for a girlfriend or a boyfriend, maybe you put together the ultimate girlfriend package or the ultimate boyfriend package. Maybe it’s a mom who would love the ultimate day of pampering, or maybe somebody who loves food. We all love food, so the ultimate chow down fest. Well, here’s something that you probably never really thought about. Go and partner with your fellow local businesses and put together a package because then you can share lists and co-promote this as one master package. I’m sorry. If you were to do an ultimate home cleaning type of a thing where you come in and they clean the house, and they do your laundry, and they leave a fresh-cooked meal, well, if you are the cleaning company, but you’re not really a restaurant and you’re definitely not going to use their kitchen, you could partner with a local restaurant to put this package together, and you could work with a florist who would have flowers that would be left, and the restaurant who leaves the meal, and the idea is if you all work together in packaging this, then you’re all providing it at cost, but you can sell it at a huge retail value. All right. Ultimately, what you’re trying to do in this survey is to understand more about them, and you can do this one of two ways. Just ask them to respond to the email or set up a simple survey in something like SurveyMonkey or something like that. All right? Then, based on how they answer, put together your offers. Eight days before launch, you’re going to send out another email and incentivize them to respond back to you. Those who you haven’t yet heard from, just a quick little email, “Hey, would really would love to hear from you of what you would love to, well, sort of two things, what you would love to see for holiday deals, and/or we’re thinking of packaging these things together. What do you guys think about it,” and maybe offer some kind of incentive for answering that. Five days before, we’re going to tease the offer. You’ve got to get them really excited and interested. We don’t just want to throw out there, “Oh, we’re gonna have this computer for sale on Black Friday,” because then all they’re going to do is price shop around. You want to tease what it’s going to be. Share some juicy, interesting details about it. Maybe come up with an image where the wrapper is torn a quarter or halfway down so they see something, but they don’t see it all. The goal is to create curiosity and mystery, so they’re going to want to come back and continue reading your emails. What you want to do is position it that this juicy thing that you’re offering is going to make them better at something or it’s going to solve a problem that they’re facing. Three days before, you’re going to create an email that goes out, which is the sale sneak peek. In this case, you’re going to actually start getting into what they’re going to save. All right? A lot of companies out there focus on percentages, 25%, 35%, 50%. What I want you to do, actually, is to focus in on the number, the hard dollar number that they’re going to save because if you can package it that you’re going to save $1,000, that gets you curious. Wow, that … because everybody is going to be having percentage off sales. Unless your percentage is higher than 50%, I would encourage you to go with hard dollar saving. People understand that. It’s real money in their wallet. As you put together these offers, you’re going to see what some of those are going to be, but you need to make it clear that limited quantity and limited timing and that you’ll be back in touch with the final details of when, where, and how they can order. You’re leading them up to this big excitement that they just can’t wait to get. Two days before, this is the need to know because you’ve been teasing all along, but not really telling them the details. Now you get really specific. You tell them when the sale starts. If you service people beyond your area, literally tell them the time zones, Pacific Time, Mountain Time, Central Time, Eastern Time. You have to make it so clear and easy because these people are going to be busy and you just need to make it so they just, boom, tell me what to do so I can do it. Lay out the payment options. Are you accepting PayPal, credit cards? What type? Cash, check? Just be very specific. Are there return or refund policies that are in place? In here, in this email, it’s everything that they need to know, so when they go to check out the ordering, click the Buy button, they already know everything they need to know. There’s no hesitation. What I would also do in this email is tell them the technical aspects of it. Remember, in the beginning, I told you, “Check out how your site performs on different browsers.” If you know that your site performs best on Chrome, then tell them. Tell them to open up in Chrome, or tell them to open up in Internet Explorer. If there are issues with mobile, tell them so that they don’t have any surprises the day that they come to your sale. One day before, just a quick three-line email. You’re going to let them know your early bird sale is starting soon. It starts on boom, and here’s the time. Just a three-line, simple email. Here we are, the first day of the sale. I bet you guys were thinking that we were leading up to Black Friday. Here’s the thing. I want you to launch your sale the day before Thanksgiving. You see, it’s going to be really hard to compete on Black Friday. Everybody’s offering their deals on Black Friday. As a small business, you can stand out by getting them ahead of them, getting them to think about you, your business, and these juicy offers and packages that you’re going to be putting together. The first day of the sale, you’re going to send out an email. The sale is live. Make it clear, bold, and easy for them to click to order. Tell them, again, how much they’re going to save. Tell them about the product and, always at the bottom, have that call to action. Click here to save. The second day of your sale is Thanksgiving day. This is a day where most people are spending time with family, so you want to be cognizant that you don’t want to bombard their email box, but you could send a very personal email thanking them for their business, wishing them a Happy Thanksgiving, and then just reminding them of the sale. The next day, the third day, is Black Friday. Here is where you should then unlock some additional items that you didn’t announce previously that were part of your big sale. All right? You can offer some items on Black Friday, and you may get some real interest in these because it is Black Friday, and people will be intrigued because it wasn’t something that you mentioned before. Again, have a clear call to action. Make it easy for them to click and order. The fourth day of your sale, Small Business Saturday. Love this holiday, although I have mixed emotions about it. Number one, it’s sponsored by American Express, the most antithesis of small business, and why should Small Business Saturday be just one Saturday a year? Maybe you want to tap into this and leverage it. You will have great sales. You will have great deals, and people supporting you on Small Business Saturday, but why make it one day a year? Make into a weekly or a monthly event, and you’ll build your list, and you’ll build recognition. What you want to do on this day is some frequently asked questions, maybe. You definitely want to have this on your website, but also included in the email. What you’re trying to hone in on is addressing any objections of why they would not be ordering this or buying this juicy item that you’re selling. Maybe they’re concerned about a warranty. Maybe they’re concerned about service. Maybe they’re concerned about how and if it will work for them. Anything that would possibly make them say, “No,” address that all in this email, and then have the call to action. Fifth day of this sale, Biz Sunday. Everybody knows the next day is Cyber Monday, so send out an email that teases what you’re going to be doing on the Cyber Monday. Don’t give them the juicy details yet. Just another teaser email, and you may want to consider having a click to a page where they can opt in to get additional information or early access, and then you’re building a list of people who you know are really interested. The sixth day of the sale is Cyber Monday. All right? What you want to do is come out with something completely new, something that they’ve never heard about, something that they’re going to be just so excited to buy, but no more than two things. Otherwise, it’s completely overwhelming. Put together really special, but uber juicy things that they’re going to want to get only on Cyber Monday. I would encourage you to put a time limit on this sale. Maybe make it last for 24 hours or limited time only, but very specific when the deal ends. The seventh day of the sale, Tuesday, by this time, we’re all on holiday hangover mode, but send out another email, if you’re sale hasn’t ended yet, reminding them that the sale ends in two hours, get it now, this is what’s left, and have the click for your call to action. All right? Here’s an example of an email that you would send out that’s really about keeping it simple. This is from CanvasPop. It has a nice, big, clear image on the top. You know you’re going to get 40% off your entire order. Just click Buy Now, and you’re done. Clean, clear, simple. I definitely encourage you to do that with your emails. Example number two, using bold imagery and animations. If you get an email like this in your inbox, that’s going to pop and get your attention and make you want to click, but it’s clean, it’s clear, it’s simple with one call to action. Example number three, this is a great example of a last-minute, extended sale. You have your Cyber Monday sale, and then you go into Tuesday. If you decide that perhaps you want to extend it, here is an example of an email that you could send out, that it’s going to be extended for 48 hours. Let me share with you some tips so that you can make this the best holiday season ever. As I’ve been talking about some of these packages, you may be thinking, “Well, gosh, you know, if I give everything away and discount so much, I’m gonna be out of business.” You need to think about using these juicy packages that you’re putting together as a loss leader, and it’s okay to offer something as a loss leader if you have an upsell process in place to make additional sales. For example, if you sell supplements or vitamin and you’re having an amazing deal on these as part of your sale, you may lose money in the first sale to get people to buy it, but if you then have a subscription that’s been tagged to it where they’re going to be buying six, eight, twelve months of additional supplements at full or even perhaps a discounted price, you will make your money back. Loss leaders are okay as long as you understand your numbers. Simple things like buy two, get one free, still work really well. Consider implementing something like future store credit. If they buy something through one of your holiday specials, they could then get money or credit that they can use at a future date because then they’re going to come back and spend more money. This works great, especially with your current customers, clients, and patients because, most likely, they are buying these gifts for other people, but then when you offer a store credit or some kind of discount or money that they can use later, it’s like a gift to them. They’re getting rewarded, and you then get that money at a future date. It’s a win/win/win for everybody. When you’re creating your emails, just remember not to include too many pictures and colors. For example, the three examples that I shared with you, they were very clear and clean. If you have too much going on, people are just going to delete and move on, especially if they’re on mobile. You need to keep it clean and clear. Also, short and simple. People are not going to read a 500-word email, a blog post from you. Be very simple, very clear. Three lines or less is what I like for most of them. Just tell them what to do and how to do it. Be aware, as you’re creating your emails of spammy words that can put you in that dreaded Gmail Promotions tab. I don’t have the magic answer of what all of those are, but (particularly if you have Gmail) go look in your Promotions tab right now. See what kind of words are in there. Those are the ones you don’t want to do, things like all caps, things that have lots of special characters and exclamation points, things that use words like free, free, free, free, repeating over and over. Just use common sense, and there are lots of ways you can get creative with your subject lines so that they end up in the inbox and get opened. Some additional tips, video. Love video. Video always helps to close the sale. I would love to see all of you guys incorporate video into your holiday marketing. Do a Facebook Live. Do some real sharing and teasing of what your holiday offers are going to be. If you’re putting together this amazing package, share and show what that’s all about and how amazing people are going to feel when they wake up on Christmas day to this amazing package. Video will help you get more eyeballs and close more sales. Holiday Sale Countdown timers work really well, also. On your landing pages and your sales pages, especially if there’s limited time, use a countdown timer. Those really work in converting people to get and take action. FAQs, those are really important, as well. I talked about you want to address all of their objections. All you want them to do is to just go, click, and buy. Have a section that answers all of those commonly asked questions. One, it’ll make it less burdensome on you, where they’re going to be contacting you with this, and, two, it’s like self-serve. People always view the FAQ section to find what they’re looking for. Make sure that your emails have a three-click maximum. What I mean by this is when they get the email and they click, then they may go to the product or the landing page. You only want them to then have one more click, and that is to buy. You do not want them having to multiple clicks to go into a category, to go into a subcategory, to dig down deeper and deeper because they won’t do it. They’re going to bounce. Three-click maximum. The easier you can make it for them to order, the better your results are going to be. Of course, if you just want your holiday marketing done, hire a full-service marketing agency, like the Small Biz Marketing Specialists, to help you get it done. “How can you do that?” you ask. I’m glad you asked. Introducing the done-for-you, best ever holiday marketing campaign. I am offering to give you a holiday marketing campaign that’s going to be done for you. I will help you create the sales, the pricing, the offers, what you’re going to offer, and how you’re going to offer it. There may be integrated marketing strategies in there, email, social, maybe even some direct mail, maybe even phone, but what we’re not going to do probably is advertising. This is an organic approach to getting more money in your bank account. I’m going to write the copy. I’m going to create the design. Everything is going to be done for you. I’m going to implement it. All the emails will be sent out by me and my team. We will be posting and monitoring all of your social channels so that you can just focus on making more sales. The investment to get all your holiday marketing done, God, $1,497. I’m crazy for doing this, but I want you to have the best holiday season ever. Just go to smallbizmarketingspecialist.com/holiday to order your package. Once you check out, I will then be notified and I’ll contact you to set up your onboarding call. I, as well, I have limited editions of this. I can only offer this package to five people because I’m limited in my capacity, but I want to help as many people as possible, so the first five that go to smallbizmarketingspecialist.com/holiday get the done-for-you marketing package. All right. Let me check my other computer and see if there are questions in the que. I see some applause, some hands up. There’s some yay for PowerPoints. Thank you, everybody, for who attended live. I really wish you guys the best holiday marketing season ever. I’m here to help you get it done. You can take what I gave you today and put it into action or work with me and my team to make it easy because that’s what marketing is about. Have a great day, everybody. 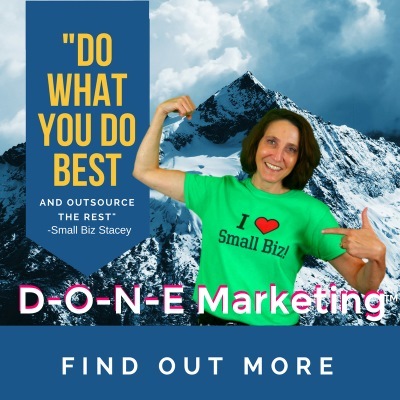 This is Small Business Stacey, your Small Biz Marketing Specialist, here to help you get your Marketing Into Action and help you become a #SmallBizMarketingWiz. This is so helpful! Thanks for sharing.